Support your local brothers and sisters and check out these American made Chippewa Men's 20065 Chocolate Apache Lacer 6 Inch Leather Boots. Manufacture to work as hard as you do this footwear supports, protects and provides you with all around comfort. Chocolat ... (see full details) (see specifications) #CHP20065. Support your local brothers and sisters and check out these American made Chippewa Men's 20065 Chocolate Apache Lacer 6 Inch Leather Boots. Manufacture to work as hard as you do this footwear supports, protects and provides you with all around comfort. Chocolate brown Apache leather was used to create the soft, mid-cut design of these premium made boots. Flexible leather surrounds your feet in comfortable durability, strength that moves naturally with your feet, so every step is effortless. Drill vamp lining adds additional softness to the long leather interiors. Four Iron midsoles and fiberglass shanks give your arches much-needed support, day in and day out. The brown Vibram outsoles (design #1752 Stockbridge) are slip-resistant to keep steady, no matter what the flooring situation may be. The soles of the brown boots are oil-resistant to protect the tough tread against corrosive, wearing chemical compounds. Goodyear Welt construction stitches the rugged leather uppers to the strong outsoles, giving you a pair of sturdy, reliable men's boots. Even the smaller, important details are tough - this work footwear features heavy duty waxed sta-tied laces and antique brass non-tarnishable hardware. Chippewa Men's 20065 Chocolate Apache Lacer 6 Inch USA-Made Boots were constructed right here in America, by workers, for USA workers - but these Chippewa boots will take care of your feet no matter where you go. Order your pair online today from the Working Person's Store. 104 out of 105 people found this product review helpful. If your looking for a truly well made boot, from exceptional leather, this is the one. This is my second pair. The first is still in great shape after years of wear, but I wanted a backup pair in case they should ever stop making them. I've had $200+ boots that can't compare. 95 out of 97 people found this product review helpful. I bought the boot hoping I would get a good slip resistant boot in a kennel setting. I also wanted a light boot for walking and being on my feet for an 8 hr shift. Love the look of the boot first off. Can be a little hot in the sun. The sole is very light weight and comfortable but can wear quick. Does not breath great I think it has to do with the preservative used in the tanning of the leather. Not a very water resistant boot. Water gets in the welt very quickly. The sole performs very well in wet surfaces. I have had them now for almost a month. The sole is starting to wear and getting a little separation in the welt. But to be fair they are walked in for a few miles a day and also in semi wet conditions. Sometimes very wet conditions. I maintain them regularly and use a shoe tree to dry them out. Time will tell how they will perform in the long run. But for now they are a good looking boot that does not tire me out in the end of the day. And the gumlite is pretty good on wet polished cement. These are my second pair of Chippewa boots. ***FYI check the construction of the boot when you get it. The soles were a tad misshaped which was no big deal but later noticed that the heel counter (the leather piece on the back of the boot) was misaligned which I would of preferred it not to be. I'm with the other guys on this. These boots are made so well but they still wear out. Even when they do I come right back to the same pair. These are my favorite yet. 78 out of 81 people found this product review helpful. These are a great boot for the price. I read that they say "handcrafted in USA" instead of "Made in USA" because the parts are made overseas and they're sewn together in the US. Regardless, they are a great boot for the price. In my experience, they run a little long and a little narrow. I sized down a half a size in length and I sized up in width, and they fit perfectly. 68 out of 79 people found this product review helpful. 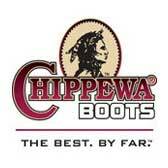 Chippewa Boots: Men's Brown USA-Made 20065 Vibram Sole Work Boots is being added to your cart.